Today we are proud to announce the formal alliance of WeMarch Bahamas as a coalition of associations focused on moving the Bahamas forward, upward, onward, TOGETHER! Our membership is a minimum of fifty thousand members and includes: Our Carmichael, HeadKnowles, Our Grand Bahama, Citizens for a Better Bahamas, We The People, ORG, Campaign for The Bahamas, Rock The Vote 242, ReEarth, Grand Bahama Human Rights Association, Save The Bays, Bahamians Awake, FOAM, RABL, Rise Bahamas, Trade Union Congress, Association of Bahamas Marinas, Mothers United For Peace, Bahamas International Film Festival and many others to come. We stand united under the banner of WeMarch Bahamas as a national alliance for progress; a union forged through the visionary ideals and courageous call to action of our founder Ranard Henfield. We commit to stand by, behind and up for Ranard, shoulder to shoulder, as the movement continues to bridge divides and encourage action on issues of national concern. We welcome any and all national groups, public officials and engaged citizens to join us as we press forward to create The Bahamas we desire for ourselves and our children. Our work to advance these pillars of progress starts immediately. Our first Think Tank meeting, open to the public, will be held on Thursday, December 8th at Galleria Cinemas, Marathon Mall, from 6-10pm. We believe that the time has come for each of us to reflect within ourselves and determine our priorities, values and vision for the country that we want to live in. 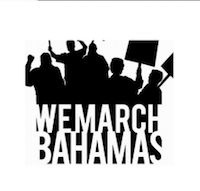 The WeMarch movement of November 25th has demonstrated to us all what is possible when people from all walks of life join together in unity for positive change for The Bahamas and every Bahamian. We ask every Bahamian man, woman and child regardless of affiliation or creed, to stand with us again on "United People's Day" this January 9th 2017 to continue to create an unprecedented wave of national support and unity as #WeMarchBahamas continues on our journey forward, onward, upward and together towards a New Bahamas for all. We remind Bahamians everywhere to resist efforts to be divided on party lines, religious views and social status any longer and to band together in unity as one people that want to end the status quo and bring about changes that will benefit all of us. We must encourage our politicians and people at large, to put our country and fellow Bahamians above self.